includes listening, grammar and writing exercises; past simple vs past continuous, travelling verbs, connectors, used to. The listening exercise is from LearnEnglish Professionals (British Council) and the exercise on the past simple and past continous is from tolearnenglish.com. This test includes listening, reading comprehension and grammar exercises, as well as a writing activity. The listening exercises were taken from "Testes Intermédios" by Porto Editora. 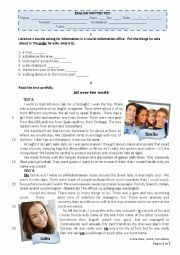 9th form test - listenig exercises from "Testes Intermédios" (Porto Editora); text about volunteer work/ environment; reading comprehension exercises; grammar - phrasal verbs, modal verbs, contrast clauses, conditional sentences; writing. 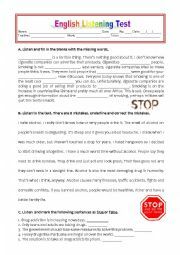 This listening test includes 3 activities about addictions: smoking, alcohol and drugs. You can download the audio files at listenaminute.com . Have a nice week! 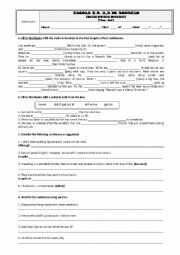 this test includes exercises on the present continuous, family realtionships and possessive case. It can also be used as a revision worksheet. A 9th form, level 5 test that includes exercises on adjective formation (use of suffixes and prefixes) as well as an exercise using present perfect simple vs present perfect continuous. 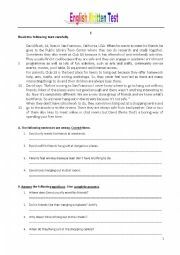 This test includes reading comprehension, grammar, writing and listening activities. The two first texts are from worksheets I downloaded here and the others have a reference to their source. All the exercises were created by me, except for the listening Activity A. The audio files can be found on the Internet. 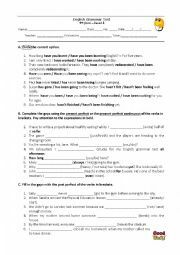 A test about the present perfect vs present perfect continuous and the past perfect. 8th form - Test about the topic "Hanging Out". I wrote the text myself after some research on the Internet. It includes comprehension exercises, grammar and writing. 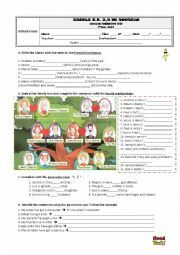 This worksheet includes exercises on past simple vs past continuous, connectors, travelling verbs and used to. Suitable for 9th graders, it can also be used as a test. Revision on the topic "Describing people" - pgysical appearance and personality. This is the first part of the ppt. Some exercises are based on the book "iTeen 7", Areal Editores. Revision on "Describing people" - part 3. This ppt. 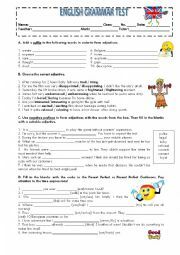 includes example sentences and exercises on the reflexive and reciprocal pronouns. I used this ppt. to discuss the topic "Friendship" and revise contrast clauses. In this lesson we also worked on the song "Count on me" by Bruno Mars. My students loved both activities. Hope it´s useful for you! I used this PPT with my 8th graders for class discussion on the positive and negative aspects of TV, based on the pictures. It ends with a summary of the advantages and disadvantages of TV. Hope you find it useful. After introducing the topic ´Food and Drink´, this PowerPoint presentation can be used either to introduce or to consolidate the use of quantifiers with countable and uncountable nouns.